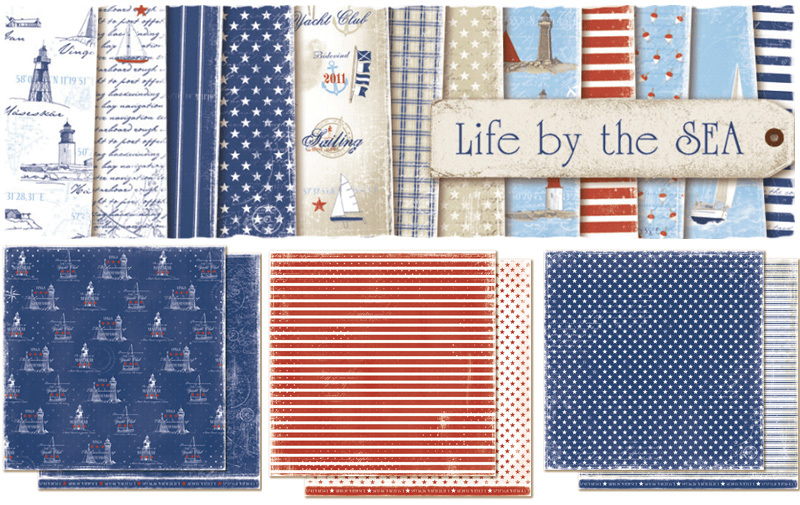 I'm here today to share my U.S. patriotic themed cards created using the fabulous Maja Design "Life By the Sea" collection. 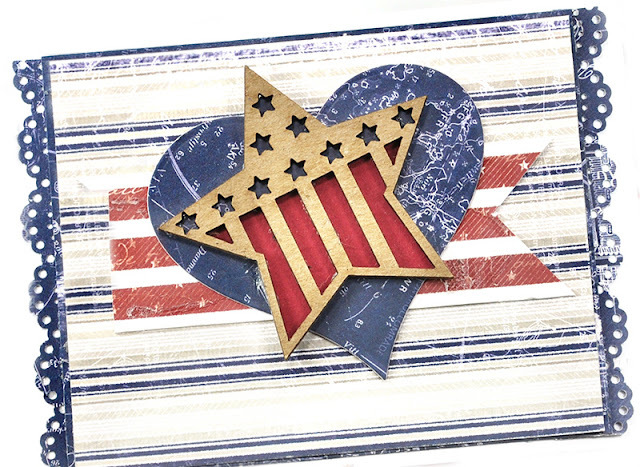 Over in the U.S., we are celebrating our Memorial Day holiday honoring our military heroes who have given their lives for our freedom. 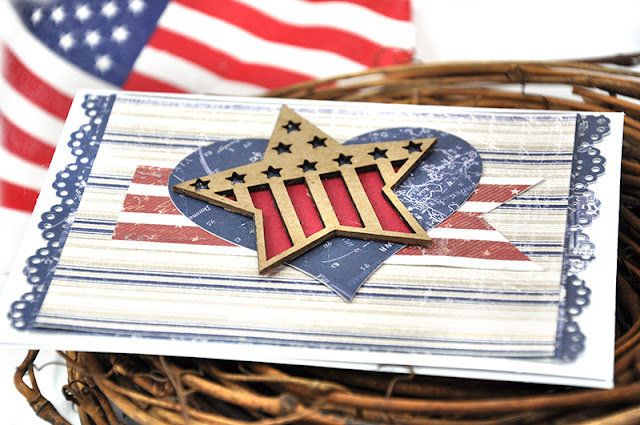 It's a major holiday in the United States - most businesses are closed and families typically gather for parties, grilling and picnics. It also signals the start to summer in the US - our official summer begins with Memorial Day. Another fun fact about our Memorial Day holiday...it's long been the standard of fashion in the US. For decades, women dared not wear anything white before Memorial Day. 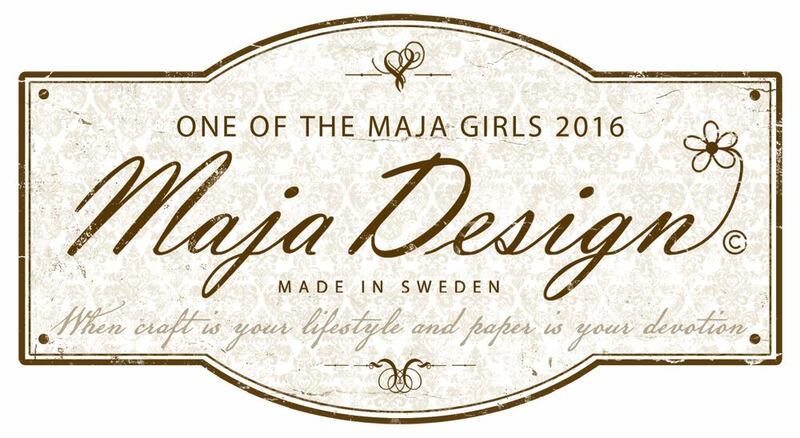 Maja Design - Life By the Sea collection. 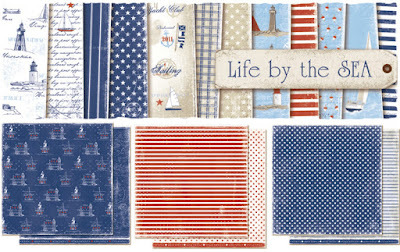 The Life By the Sea collection is perfect for my patriotic and nautical projects. Here is my first card. It's simple and classic. 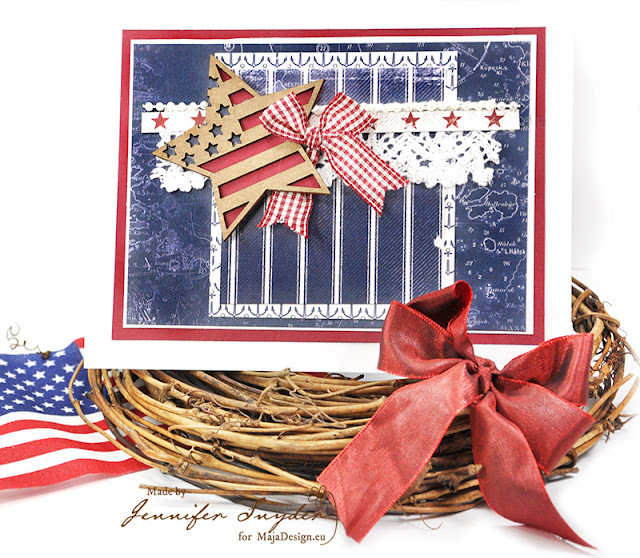 The chipboard star is from Creative Embellishments - Patriotic Stars. I love this collection because it can be easily used for vintage projects simply by adding a little inking on the edges of the papers. It's also my favorite paper to use when I am creating anything with an "Americana" theme -which I adore. Here is my second card. 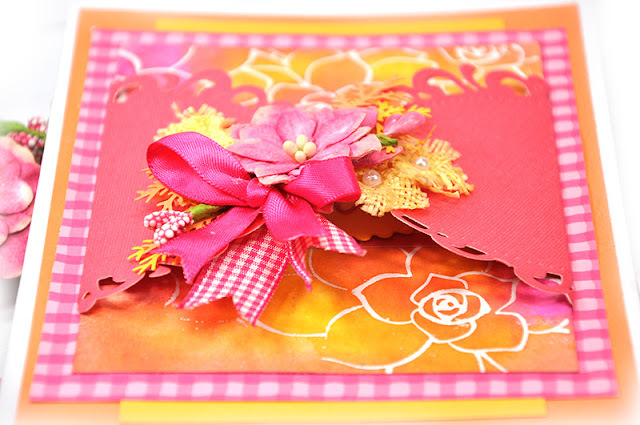 This also has the fun star chipboard from Creative Embellishments. Here's to a wonderful warm summer filled with friends and family, health and safety (plus some paper crafting fun too). Creative Embellishments - Patriotic Stars. Spellbinders has a large assortment of gorgeous, fun and interesting dies that have recently been released. If you haven't stopped by their store lately, you're in for a treat. As a Spellblogger, I had an opportunity to use of few of the new dies. 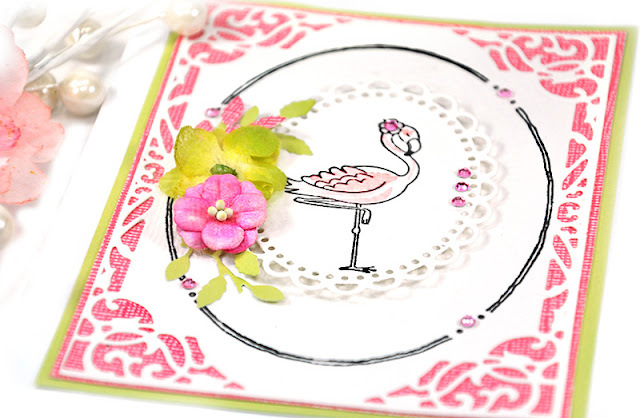 I am having so much fun using the Spellbinders Nestabilities - Rouge Royale Deux Collection - Fleur de Circle-by Stacey Caron , I decided to do a "Part Two" post showcasing how gorgeous this die set is. Part One can be found here. This is the card from "Part One". 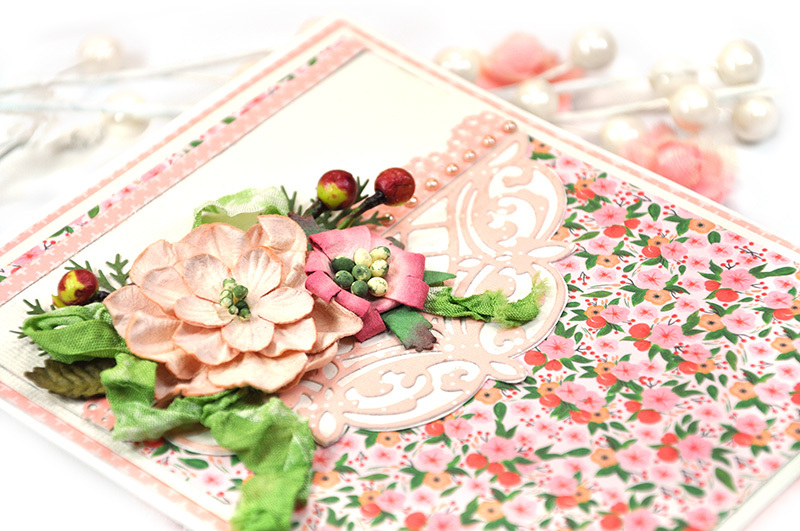 And of course, beautiful paper is essential for a beautiful card. I chose Graphic 45's "Portrait of a Lady". It's soft, elegant and really helps showcase the gorgeous Spellbinder dies. 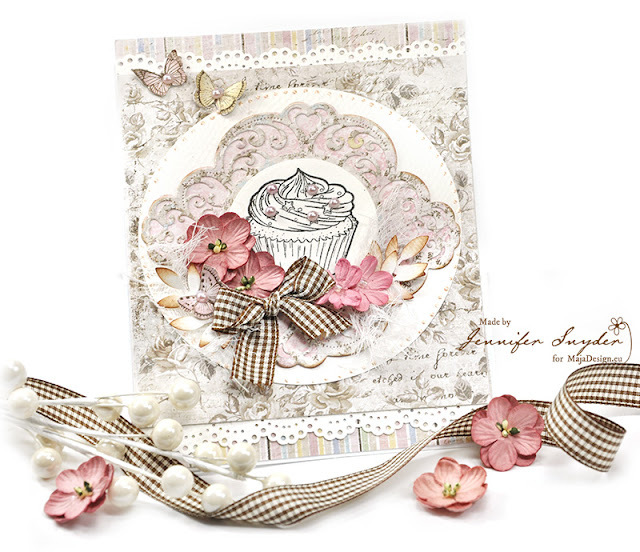 - You can be inspired by more Graphic 45 creations on their blog. 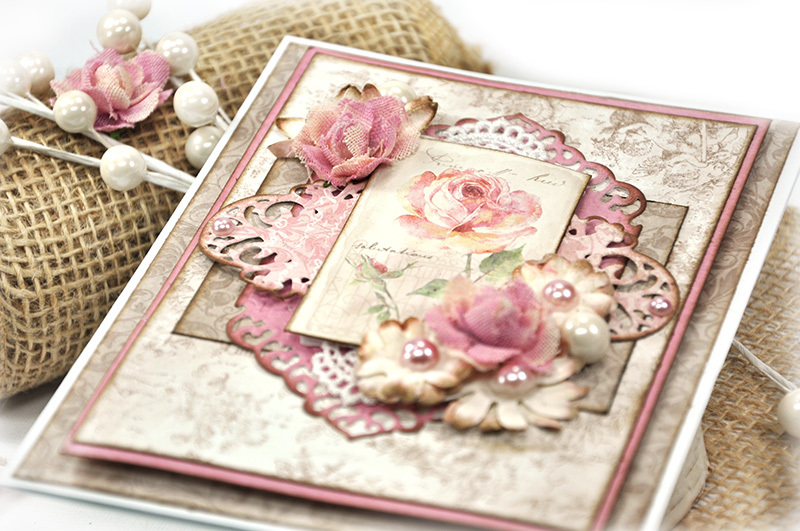 Today I'm showing the same die just decorated and embellished differently. 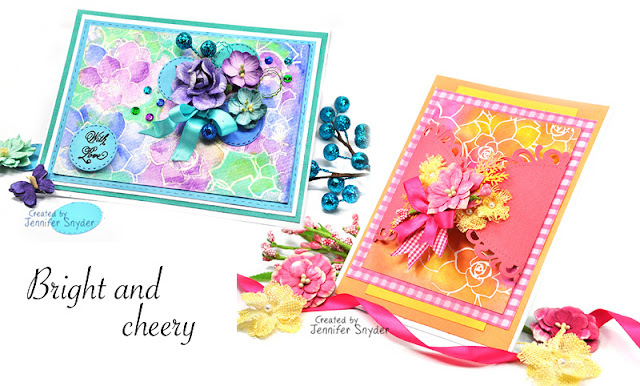 I used the Graphic 45 - Portrait of a Lady Collection on both cards. Incidentally, the card above was Graphic 45's post of the week (May 25 2017) so that's very cool news. 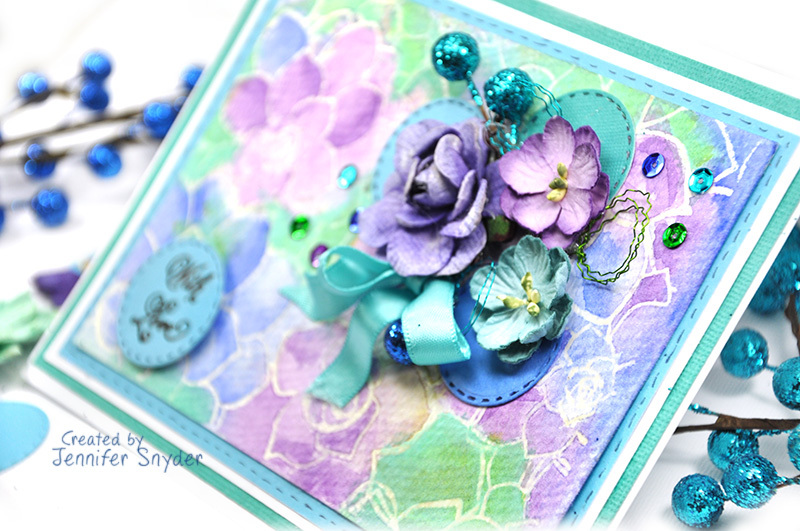 Here is a better angle to see how cool the Spellbinders Shapabilities Foliage Flourish looks tucked into the florals. It provides an airy feel to the card. If you are interested in learning more about being a Spellblogger, click here for all the information to set you on your way. .
Shop for Spellbinders products and visit their blog for daily inspiration. As a Spellblogger, I had an opportunity to use of few of the new dies. I'd like to share what I made with these new releases paired with some not so new releases. 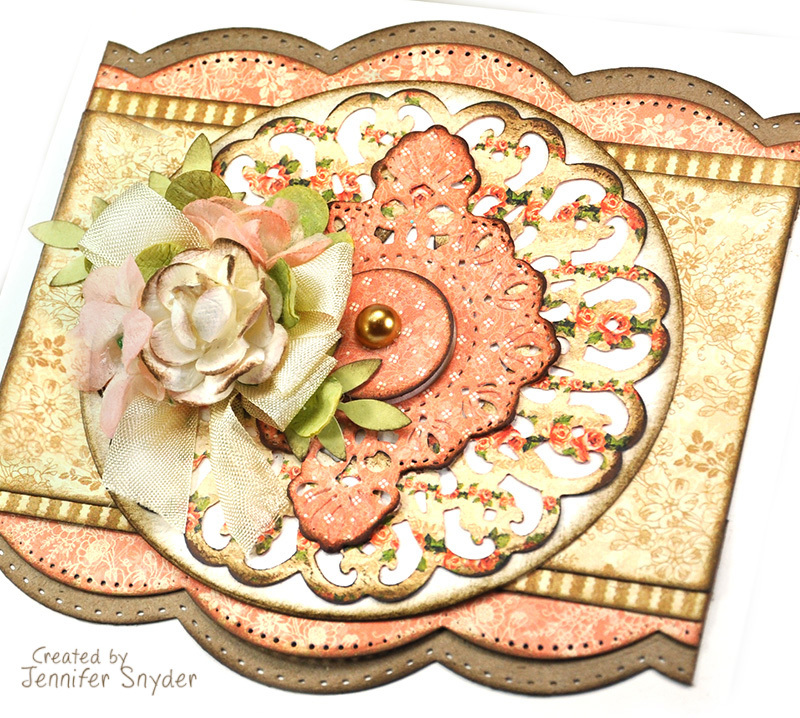 This post is Part One featuring this particular Doily die. You can find Part Two here. I'll start out showcasing the Spellbinders Nestabilities - Rouge Royale Deux Collection - Fleur De Circle-by Stacey Caron . 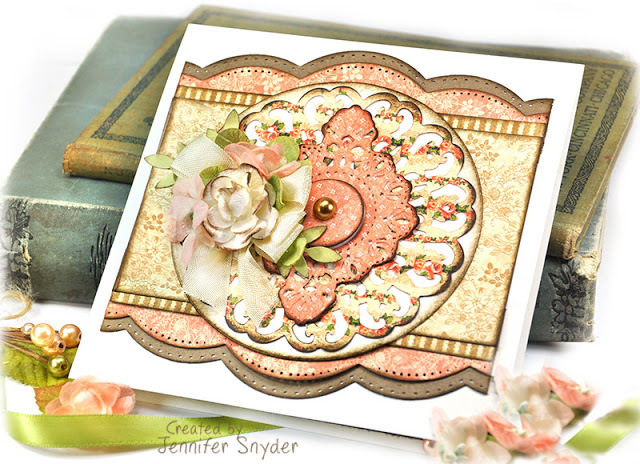 This die is the graceful and gorgeous doily used as the focal point of my card. I also used it for the tag on the inside, but we will. get to that in a bit. 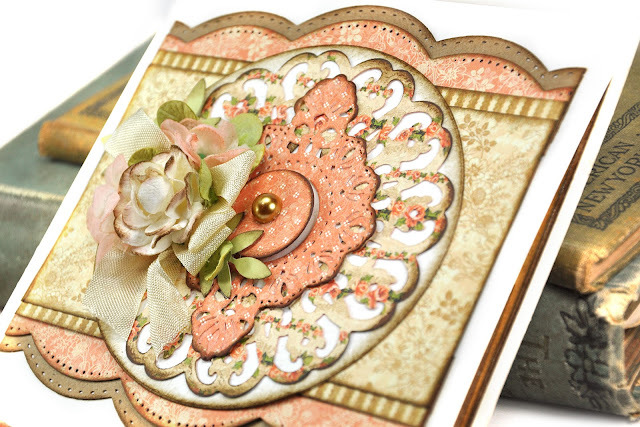 The white circle backing behind the decorative doily is also from the same die set - thus perfectly designed to fit behind the doily and make it really pop on your project. My paper choice on this project is Graphic 45's Portrait of a Lady. I used the 8x8 pad. Just gorgeous. Incidentally, the card above was Graphic 45's post of the week (May 25 2017) so that's very cool news. 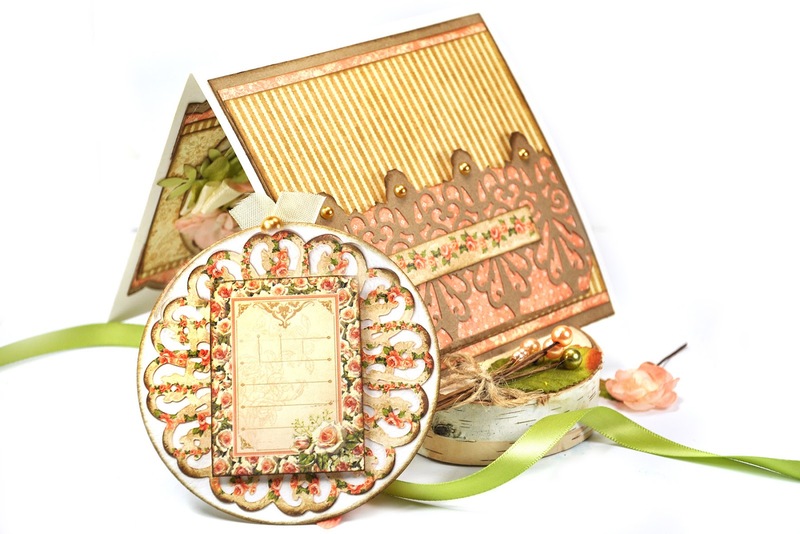 I topped the doily with a cool Die D-Lite, Spellbinders Die D-Lites Symbology Frame and added some perfectly coordinated flowers from Petaloo: Darjeeling Mini Garden Rosettes in Cream and Petaloo's Botanicas Mini Flowers in Coral . As promised at the beginning of the blog post, I want to share how cool the Spellbinders Nestabilities - Rouge Royale Deux Collection - Fleur De Circle-by Stacey Caron is as a tag inside my card. I left space in the center section to add a personal sentiment or note. 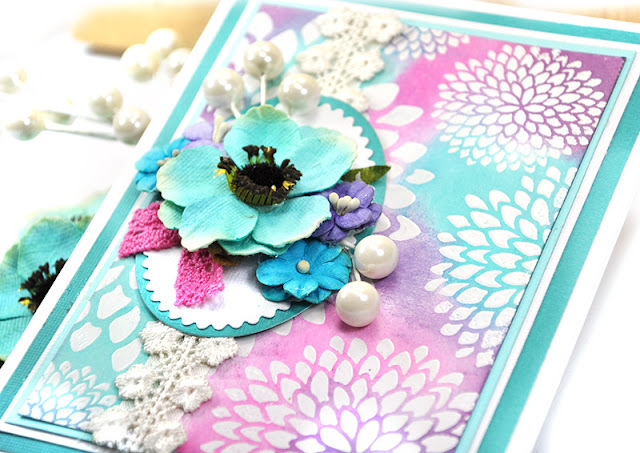 The inside of the card has a pocket created by using the newly released Spellbinders Shapeabilities Fretwork Pocket Etched Die. Very cool indeed. The pocket is handy for storing a tag or gift card even. The last image is a close up of the inside pocket and the accompanying tag. Today I'm sharing my cards for spring. I have two cards I'd like to present all gussied in gorgeous Petaloo. 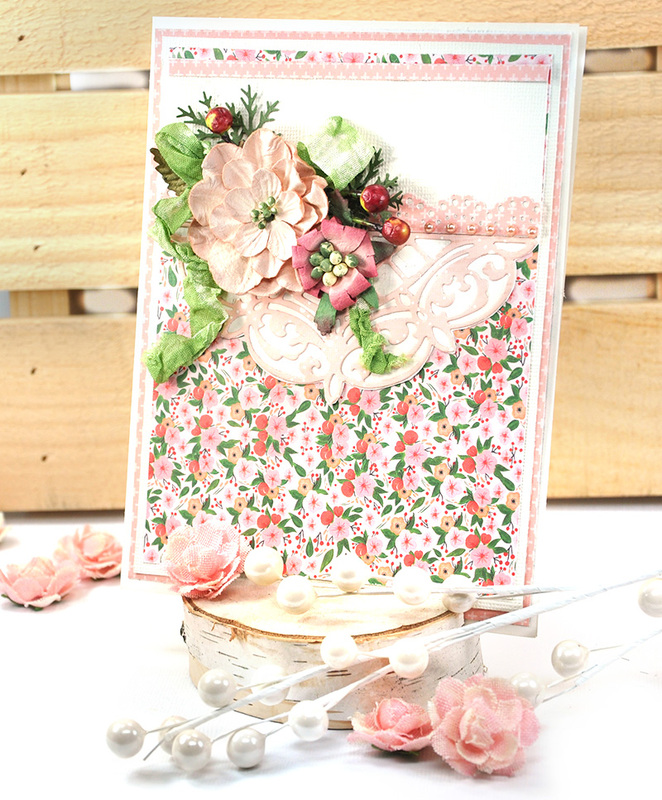 Here is the first card features the wonderful Petaloo Penny Lane - Mixed Blossoms Antique Rose . 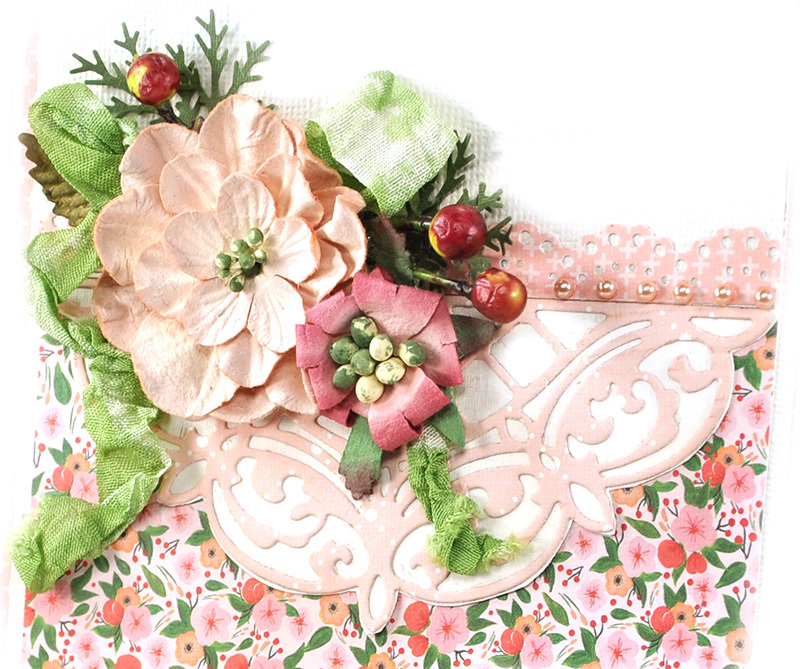 I've tucked in some dyed seam binding ribbon and floral berries for added fullness to my floral cluster. The paper collection is from Carta BellaFlora #1 6x6 paper collection. 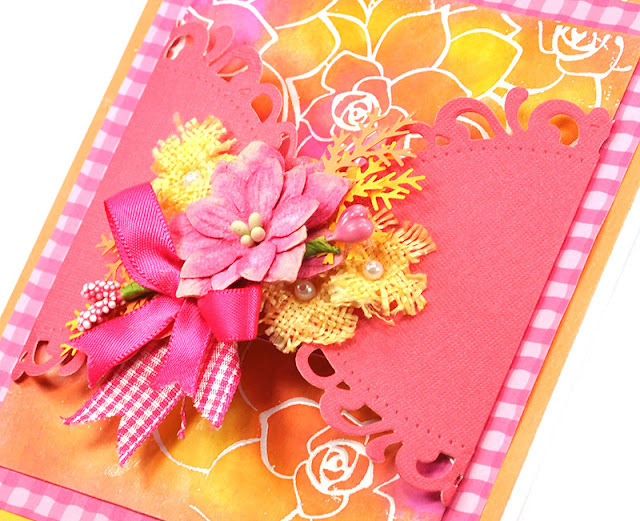 Isn't this sweet and cheery up close? 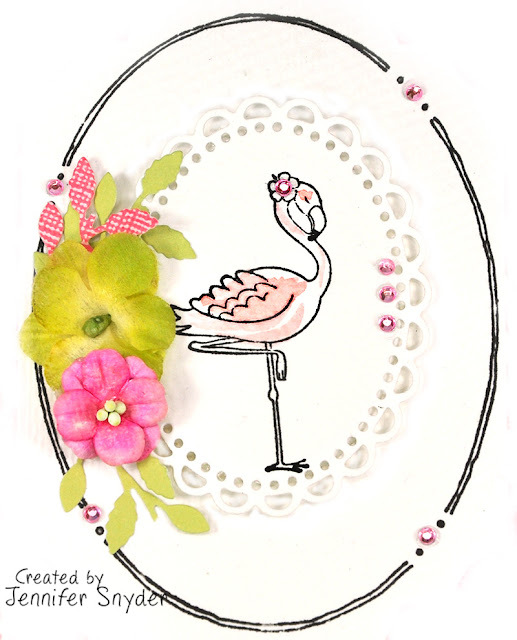 The flamingo stamp was inexpensive - from Michael's super-cheap craft bins near the checkout....yeah the ones you have to walk past and can't help but paw through. My oval stamp is cool - Stamps by Rubberneckers freehand frame Oval . The rectangle die cut frame also fits the summery look with the bright pink background. 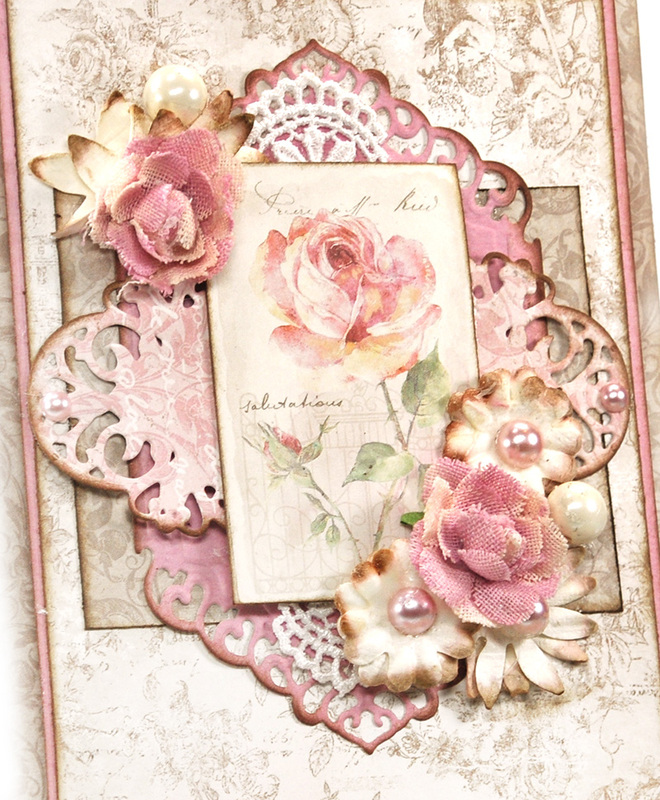 This is from Spellbinders Card Creator Dies - A2 Divine Eloquence . You can find more Petaloo products listed here, and I invite you to join and LIKE Petaloo on Facebook right here. Happiness is crafting with Petaloo. Thanks for stopping to visit. 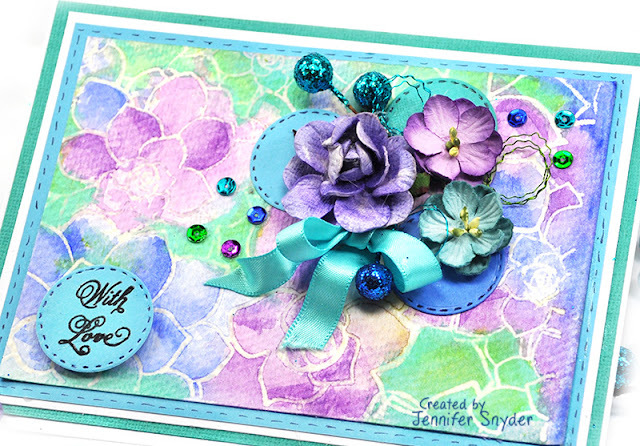 Newly released and boldly gorgeous- JustRite has a new large cling stamp that has the full coverage needed for a card. 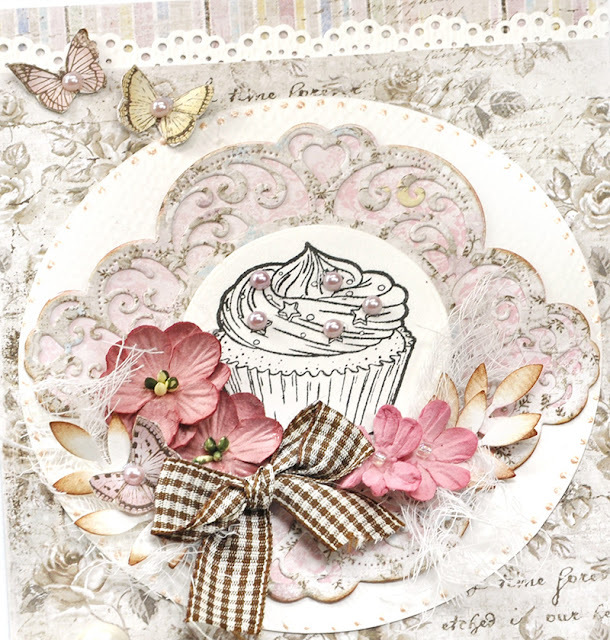 Background stamps are great to use for texture on cards, tags, ATC's , scrapbook pages, mixed media projects and so much more. 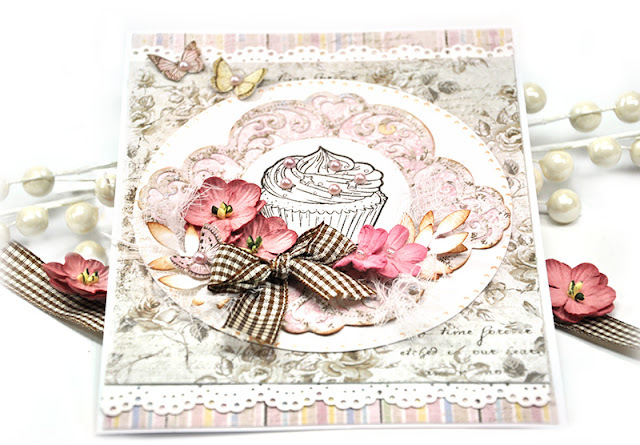 Introducing the JustRite Papercrafts Dies and Stamps - Dalia Background Cling Stamp. 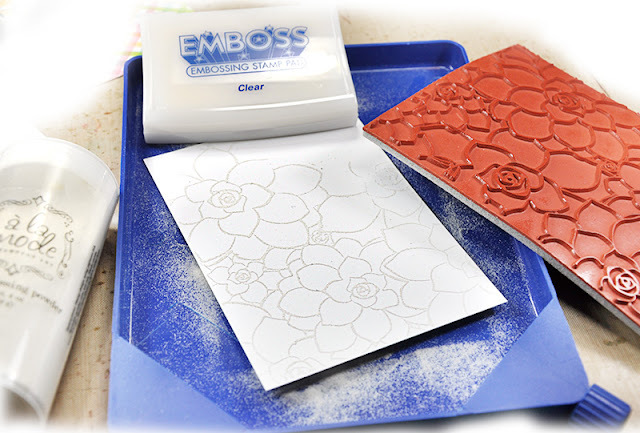 The background stamp was embossed onto Specialty Paper for Stamping using clear embossing powder. 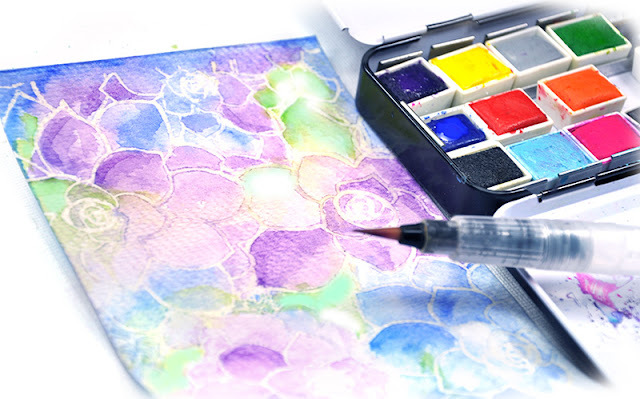 This paper has a glossy coating over it allowing the distress inks to blend smoothly over the surface of the paper. 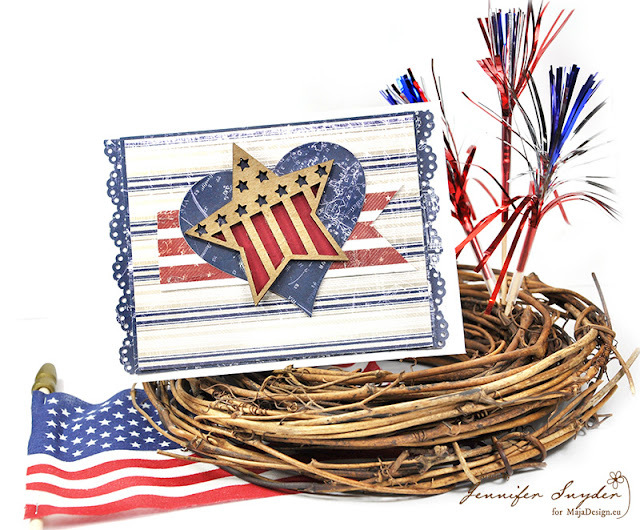 You can shop for all the wonderful JustRite dies and stamps here. 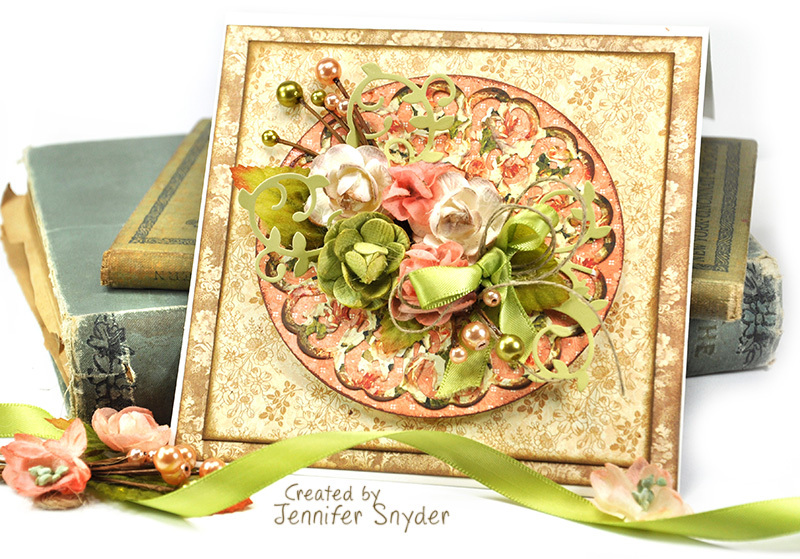 This is a card I created using a gorgeous Spellbinders die matched with exquisite Maja Design papers. The results are dainty and delicate. 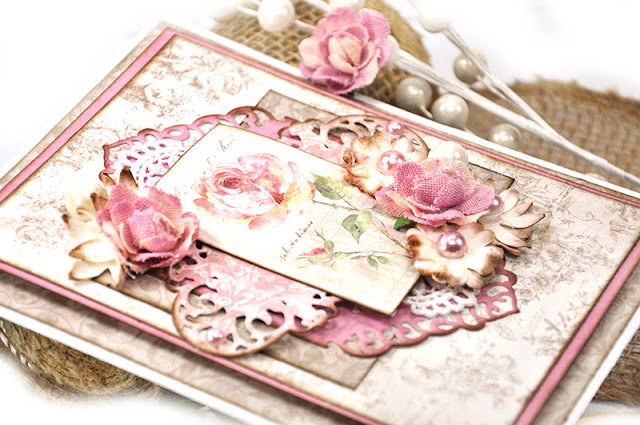 Since the papers I chose were soft , I thought my die choice, Spellbinders Nestabilities Card Creator Collection - A2 Divine Eloquence was the perfect choice - as it is also equally graceful. 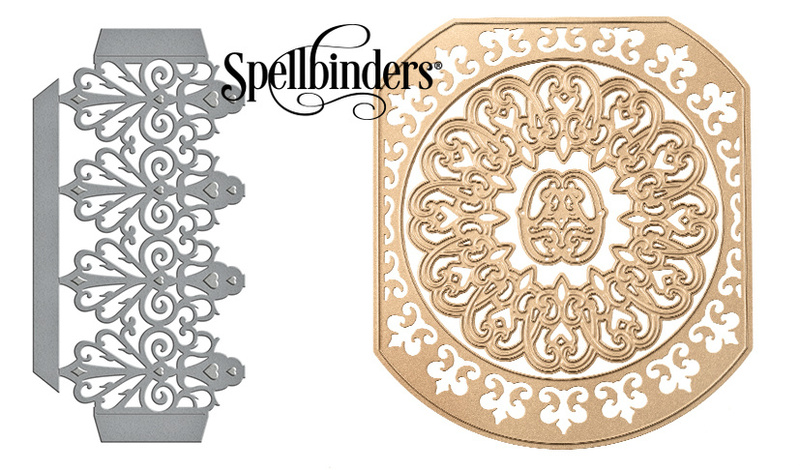 The beautiful Spellbinders Divine Eloquence die comes with 4 pieces. 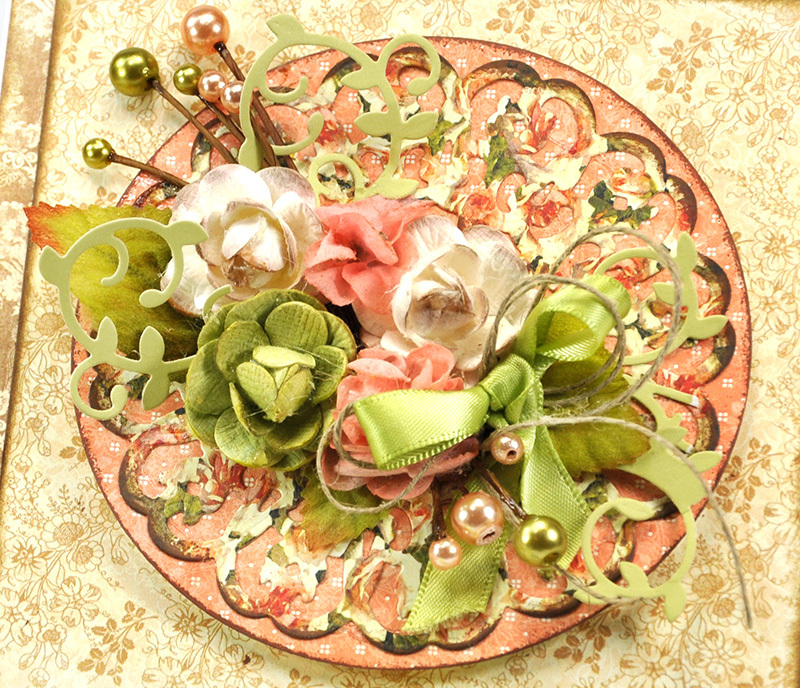 I layered two of the pieces and used as a mat under the small rose focal piece. After that, I completed the card by adding a few Petaloo flowers : Petaloo Flowers Textured - Mini Garden Rosettes and Petaloo Darjeeling Mini-Mix in Cream . This was created to play along with the Mood Board over at Maja Design. 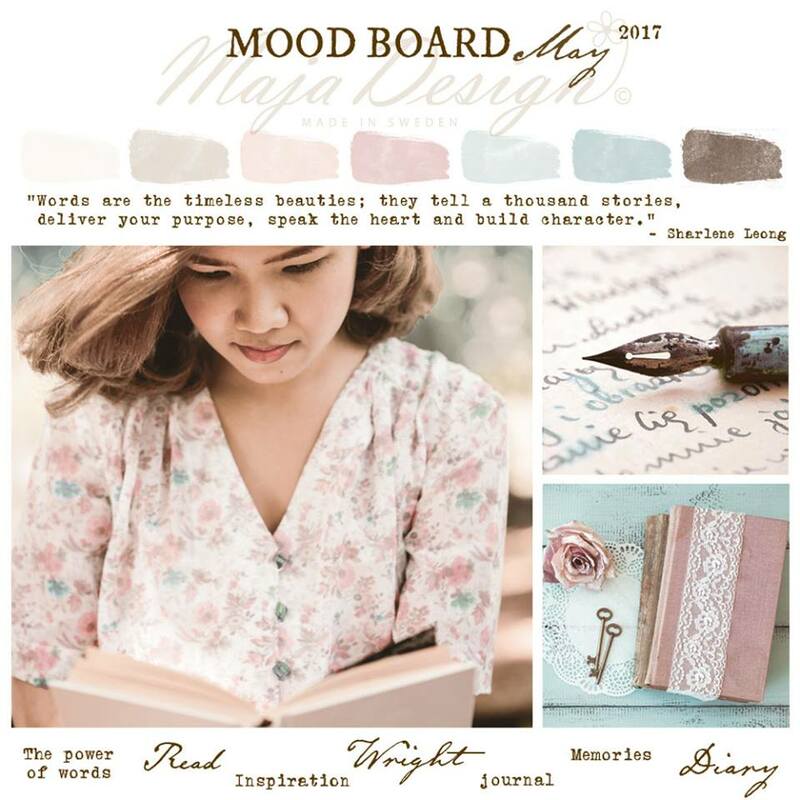 The Maja Design collection, Sofiero, was used on my card along with the new solids collection -Maja Design Monochromes - Shades of Sofiero . The solids are perfectly matched to accompany the Sofiero collection. The next two photos show the way the Spellbinders die rests as layers on the Maja Design -Sofiero paper. I did not glue the edges down completely flat on the card. This lets the die puff up a bit for some dimension and a bit of texture on the card. 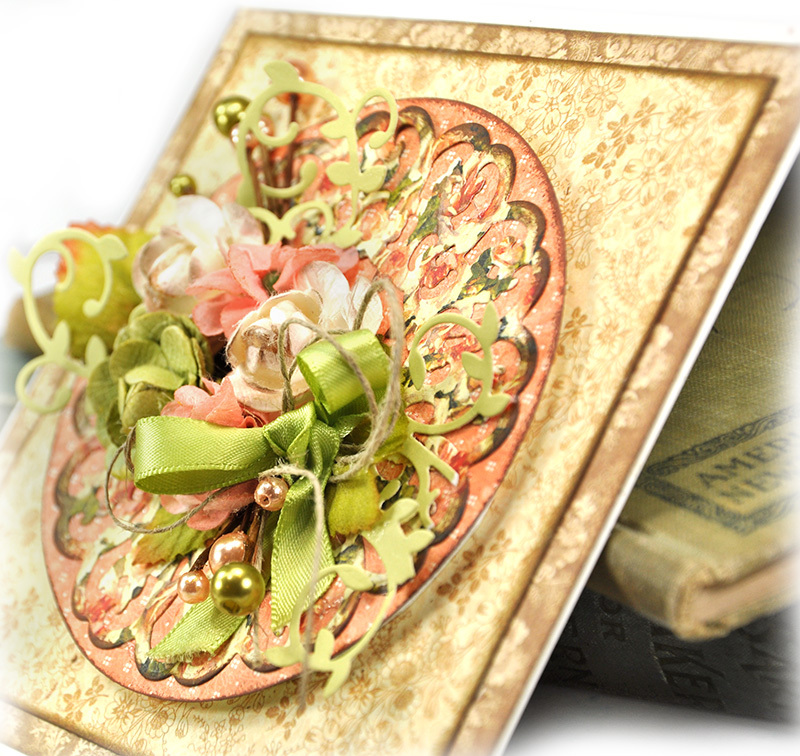 You can shop for all the Spellbinders new arrivals right here. You can also learn more about the SpellBlogger program right here. 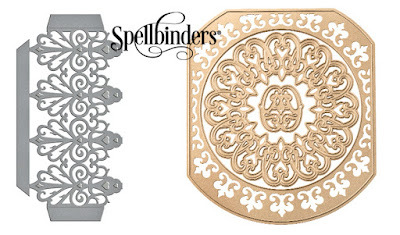 See the Spellbinders new arrivals right here. I'm here today with a graceful birthday card created by pairing papers from the Vintage Spring Basics and the Vintage Autumn Basics collections. 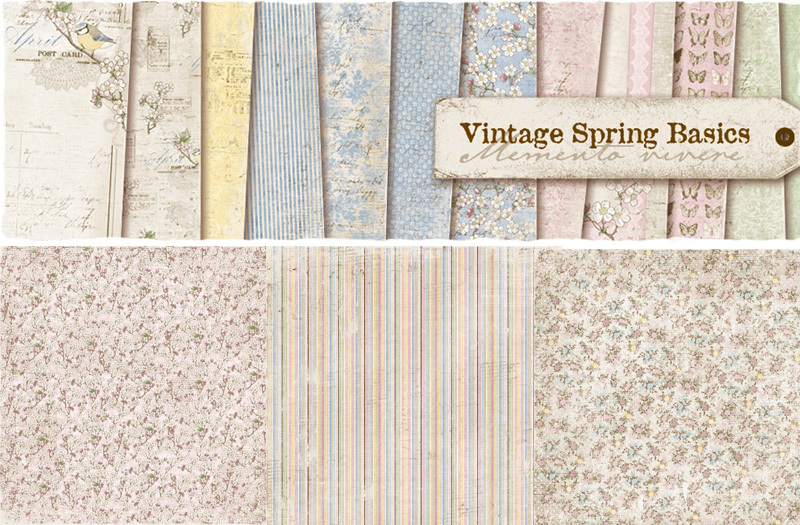 The beautiful thing about the "Vintage Basics" collections is that they were made to mix and match. That's just what I did. 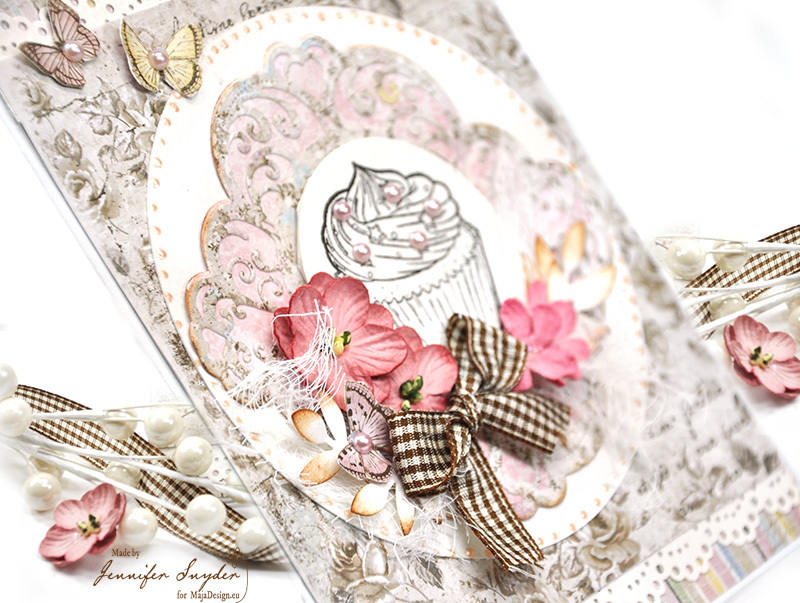 The tiny delicate butterflies were from the Maja Design Papers - Vintage Spring Basics - 6th of May 12x12 paper. They make great card accents. 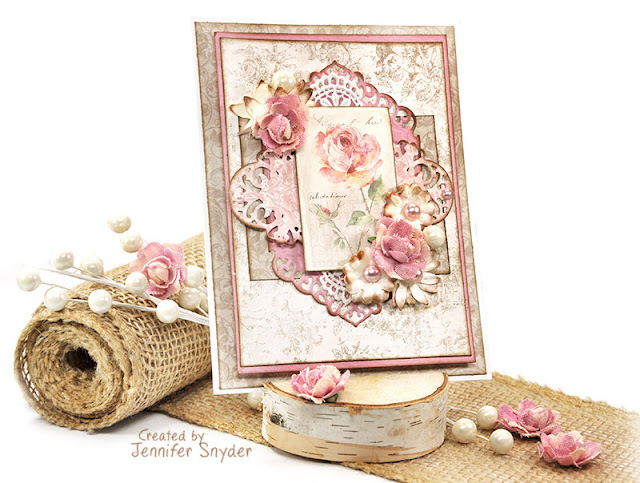 The sweet floral pink pops of color are Petaloo rom the mauve flowers Petaloo Penny Lane Forget Me Not - Antique Pink and the darling cupcake stamp is from JustRite Papercrafts. After a long and dull, cold winter, I need a big dose of color - bold, bright, happy color. Thus I set off to make myself happy. Happiness is easy to achieve when I use my favorite Petaloo products. 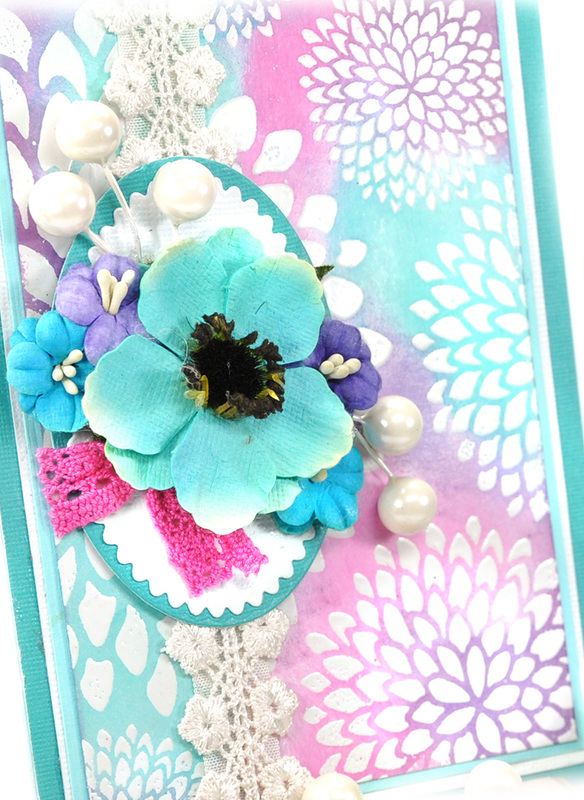 I have some short DIY instructions to show you how you can achieve these looks at your craft table. 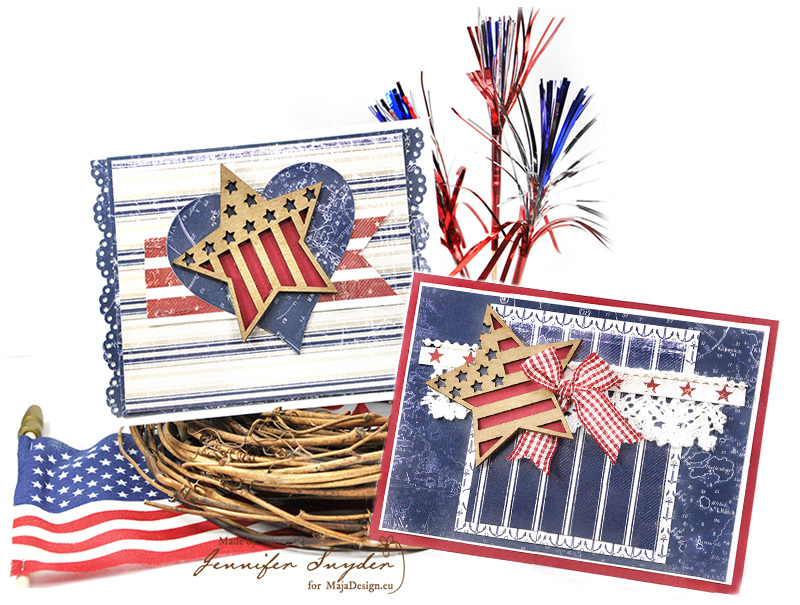 I created two cards using the same background stamp, just applying different colors and different coloring techniques to complete the project. My background stamp is from JustRite PaperCraft Succulent - Background Cling Stamps and is great for experimenting with technique. The large floral pattern is great for pairing with any Petaloo flower. The possibilities are limitless. 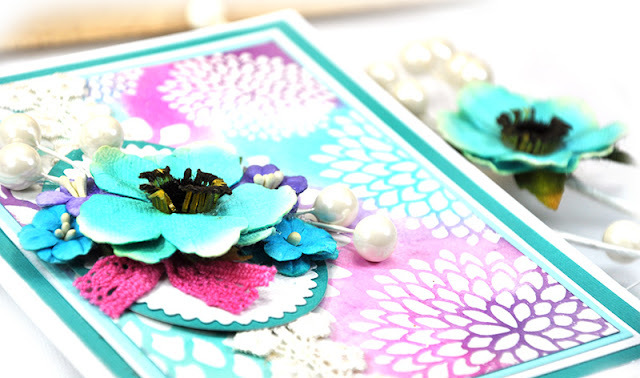 Below is a closer look at the Petaloo florals that adorn this card. Step. 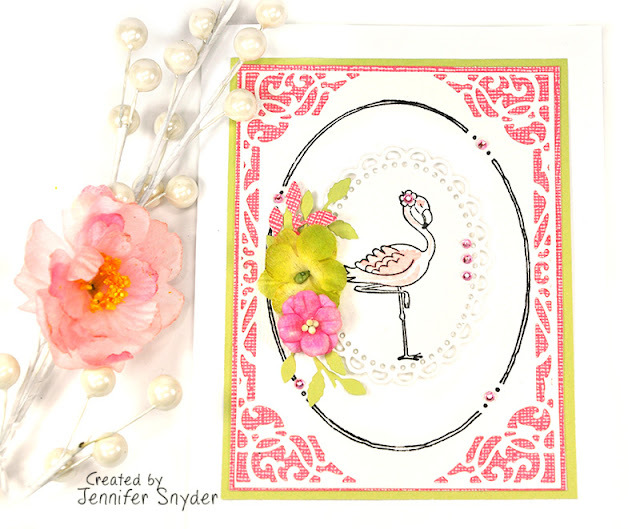 1 - I stamped the image onto " Specialty Stamping Paper for Inks" using Clear Embossing Ink and the Misti Stamping Tool ( Most Incredible Stamping Tool ). This helps provide a clear and crisp image. I am not looking for a distressed image - I really am desiring a crisp clean image. For this reason, I also did not choose to use distress embossing ink. Step. 2 - I coated the specialty paper with clear super fine embossing powder (white embossing powder works nicely here as well). 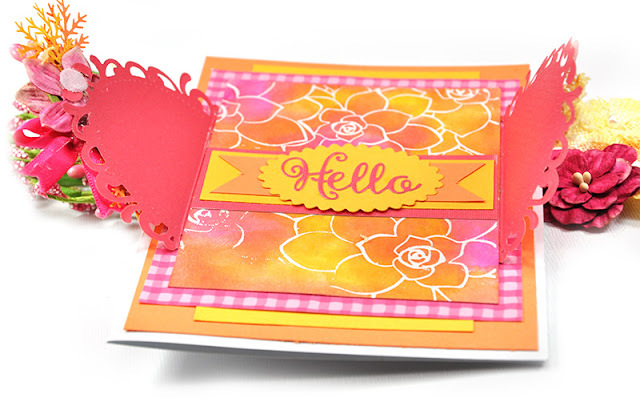 Heat and set with a heat embossing tool/heat gun. 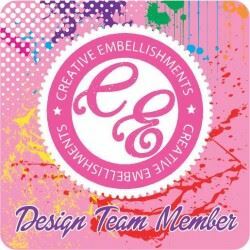 Bonus Tip - With products like embossing powders, glitter and beads, I find that clean up is much easier when using a craft tray to help catch all the extra product. I'm not really great at sweeping and vacuuming so I like to avoid that one task when possible. Step. 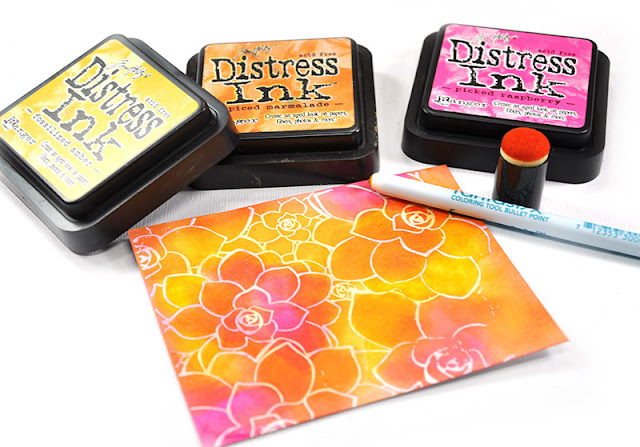 3 - Pick some Distress inks and start blending. 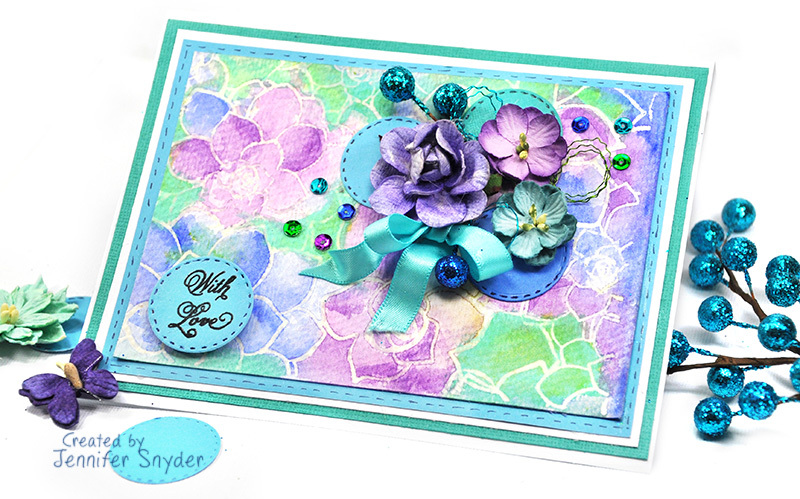 I was able to blend gorgeous color combinations on the specialty stamping paper using various Distress Inks and blending tools. Step. 4 - Moving on to the embellishing phase. I die cut two decorative ovals from JustRite PaperCraft and scored them at the center so they could be crisply folded and used as flaps to hide a surprise sentiment. Step. 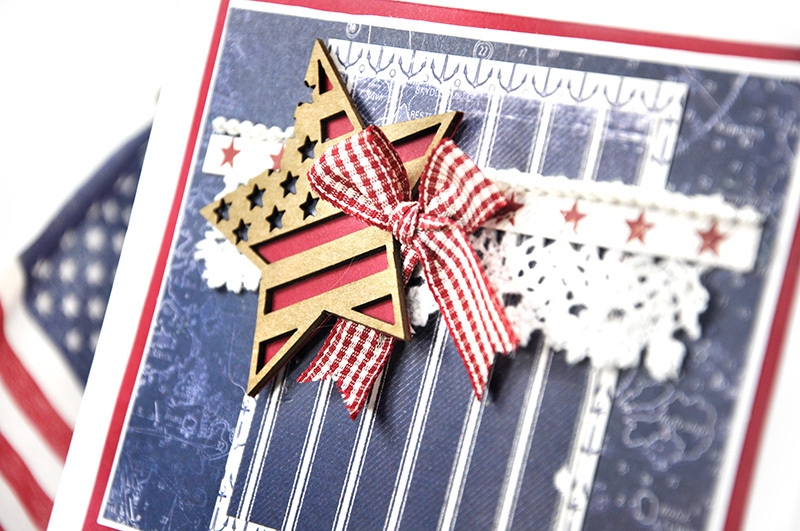 5 - Secure the decorative ovals to the stamped card . 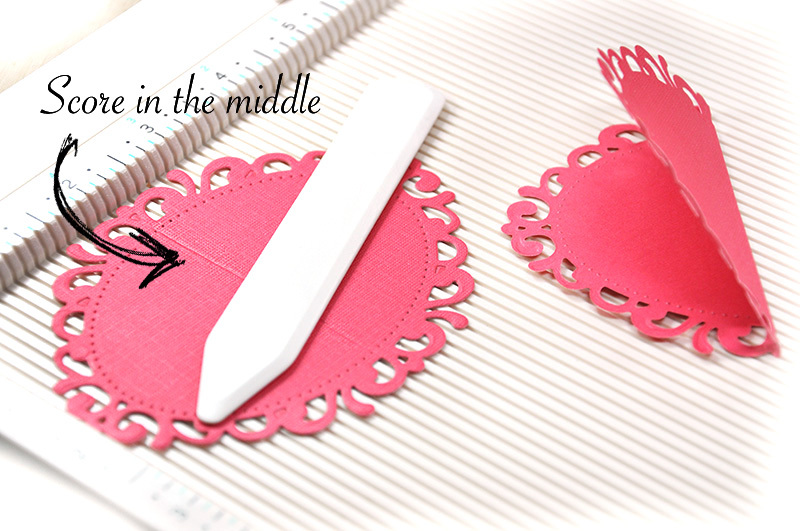 To do this, align the fold against the side of the card. Once in place, they will act like "flaps" to hide a surprise sentiment when closed. 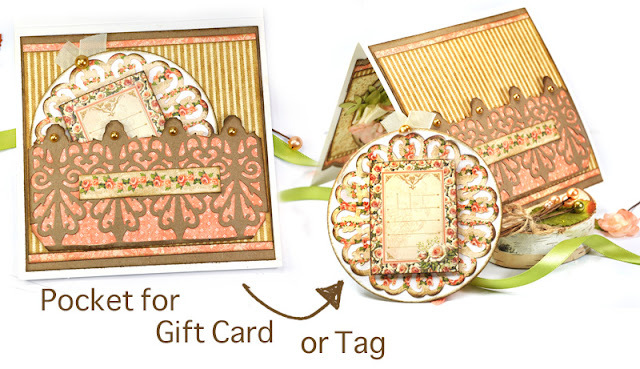 Here is an image of the front and back of the card once the ovals are attached. Step. 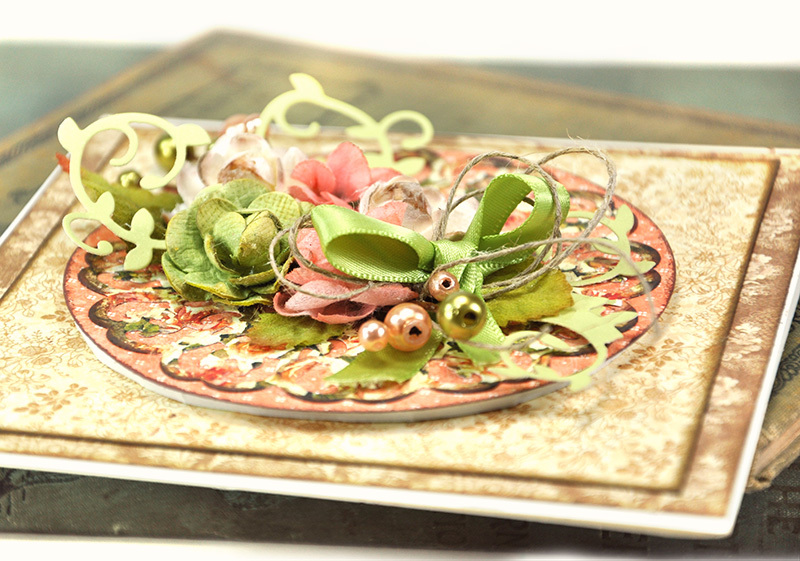 6 - Embellish as desired with coordinating and colorful Petaloo flowers. After you are done embellishing, add a Velcro dot to each side of the flap so the card stays closed. I purchased the Velcro dots in the notions section of a big box store. Important Tip - as you add flowers, trims, bows and various embellishments to the flaps, make sure the flaps still open. Do not make the mistake I made of gluing this and that to the flap without a care, then assume it will open like it should. I was thankful my glue had not set up and could still move the products around. phew! Here are a few more close shots to help understand and see the dimension of the card. Here is the sweet surprise you find once the card is opened. 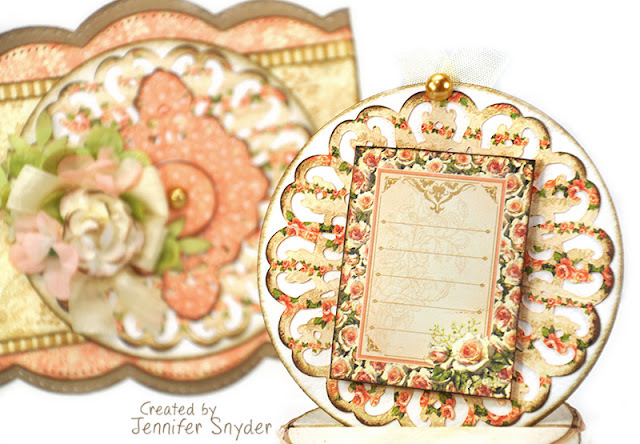 The "hello" sentiment is a die from JustRite PaperCraft - Hello Decorative Oval Frame Die. 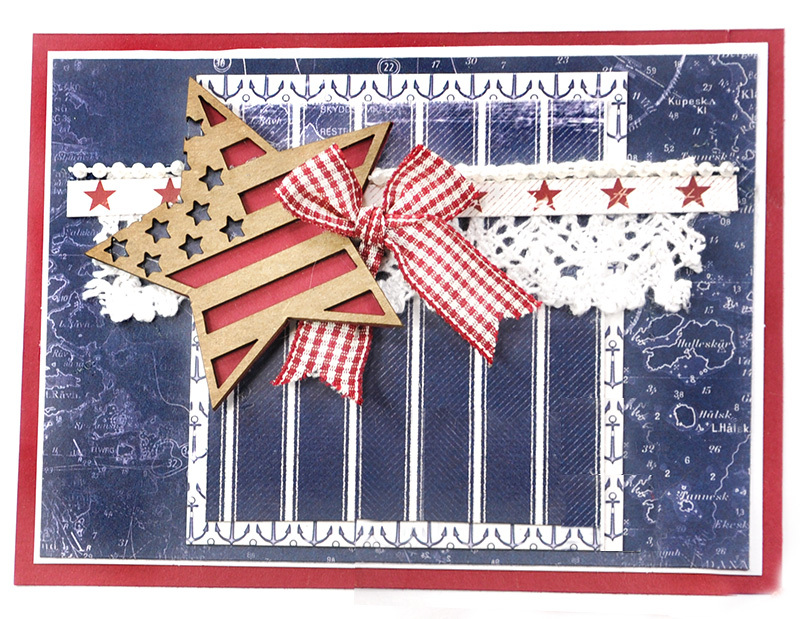 This is my second card - made using the same background cling stamp from JustRite, called Succulent but with a different technique applied in coloring the background. Just as in the first card, I used Clear Embossing Ink and Clear Super Fine Embossing Powder but stamped on Cardstock for Watercolors . I did not use the specialty paper for stamping which was used on the first card. That specialty paper for stamping is not good to use with watercolor paints. At that point, I cracked out my Prima Confections and water brush and had some fun. I knew Petaloo flowers would be perfect matches for my watercolor choices. 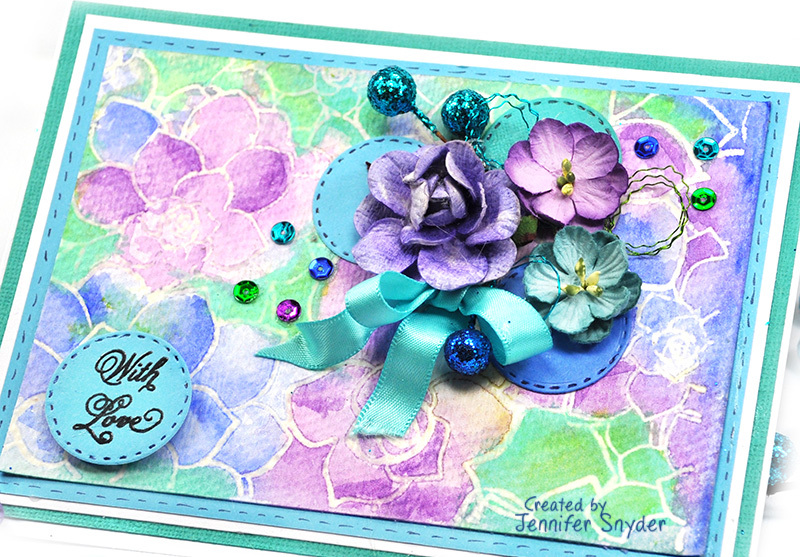 In addition to the JustRite Background Cling Stamp used here, I added some die cut circles also from JustRite's - Four in a Square die set for accent and as a place to add a stamped sentiment. 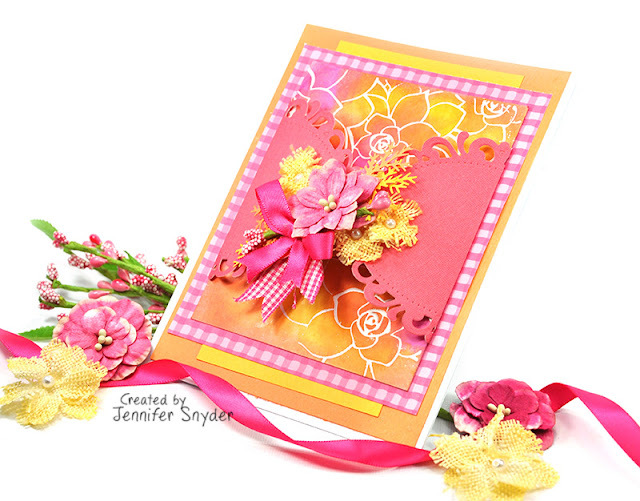 There is a lot of color, movement and bold pattern happening on this card. I believe the solid circle dies act as "anchors" for the eye to help draw the eye to the Petaloo flowers. Thanks for stopping here to look and share your time with me. I appreciate this a great deal.